The applet below displays 10 points plotted in the coordinate plane. It also displays (what's called) the best-fit-line for these 10 points. Shown also is a number we call the correlation coefficient (r). You can drag these points anywhere you'd like. As you do, watch what happens. Interact with this applet for a few minutes. Then, answer the questions that follow. Reposition (rearrange) all 10 points so that the correlation coefficient (r) = +1. How would you describe the position(s) of these points? Be specific! Reposition (rearrange) all 10 points so that the correlation coefficient (r) = -1. How would you describe the position(s) of these points? Be specific! Can you drag the points around so the correlation coefficient of the best fit line is zero? Try it. 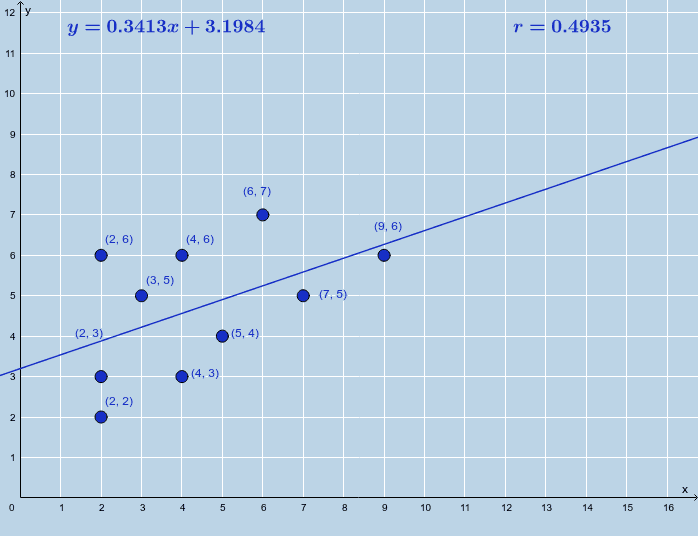 Try to position the point(s) anywhere so that the correlation coefficient r is between 0.90 and 1.00. Describe what you see. Repeat question (4) a few times, but this time try to make r a) between 0.80 and 0.90 b) between 0.50 and 0.60 c) between 0.20 and 0.30 Can you make any generalizations based upon what you see? Try to position the point(s) anywhere so that the correlation coefficient r is between -1.00 and -0.90. Describe what you see. Repeat question (6) a few times, but this time try to make r a) between -0.90 and -0.80 b) between -0.60 and -0.50 c) between -0.30 and -0.20 Can you make any generalizations based upon what you see?